I finished my VCE in 1995 and like many at that age, I was still unclear about which direction I wanted to go in life. I had an interest in wildlife and working in the outdoors, but I didn’t have much of an idea beyond that. After a brief period of study and some volunteer work at a small wildlife park, I successfully gained a zoo keeping position at one of Australia’s leading zoos (Melbourne Zoo). I was inexperienced and pretty overwhelmed by the opportunity, and couldn’t believe how lucky I was to get employed in this very competitive industry. I loved being a zookeeper, but like any job there are pros and cons with the work. I found general husbandry work to be very repetitive, and dealing with the ethics of keeping animals in small exhibits with a lack of stimulation for many of these animals sometimes made for a conflicting work environment. Zoos do some great work, but at what expense? Working with a bear or tiger is an amazing experience at first - but once you have spent considerable time cleaning, feeding and attending to their most basic needs day after day, the reality of their captive life sinks in. Working on the carnivore section in 1999, I started to think outside of the square. The bears were not being challenged mentally or physically in their daily routine. I made a suggestion to my colleagues - that we try and train the bears to do some basic behaviours as a form of enrichment. I’d always trained my dogs at home, and seen great benefit in the stimulation it provided. The carnivore keepers at the time mostly thought training was for circus animals, not zoo animals, and dismissed my idea. It was at this point I started to rethink where I wanted to be in this industry. There seemed to be a very closed attitude towards change, with some of the management team and some of the keeping staff seeming to be more concerned about the appearance of an exhibit and public perception rather than enriching the lives of the animals in the zoo. The carnivore keeping staff were also very skilled and far more experienced than me, which put me in a predicament - do I challenge the status quo or take the path of least resistance given I did respect them and looked up to nearly all of them. Even with the general consensus among the staff being against the idea of training the bears, I pushed on with the quiet support of my supervisor and started training basic behaviours. As the weeks went on I started to feel a fair bit of tension in the team, with some members thinking I was heading off on my own tangent whilst a couple of the others started to support some of my endeavours. It became a continuing ethical debate around the value of training in zoos and if it truly had a place. Around this time a senior member of zoo staff caught up with me for a chat, he had picked up on some of the team dynamic and was an experienced marine mammal trainer. He said if you truly want to learn how to train animals and the benefits of training in a zoo environment, the carnivore section isn’t the place to do it - you need to work with either the elephants or seals. Both of these species had dedicated training programs and it was considered a necessary part of their daily husbandry at the time (training has now become an integral part of husbandry practices across a wide range of species, including the bears). Soon after this chat, I saw one of the elephant keepers one evening and he told me he was leaving the elephant section. The training program at the time was not very structured and despite the best efforts of the keeping team, the handling practices were far from a good standard. As a result, the female elephant had been attacking staff and it was lucky that she had so far not caused any serous harm. Being young and a little naïve, I thought this was my opportunity to get onto a training section in the zoo. Within a month of expressing my interest to the curator I found myself on the elephant department. The elephants at the time were in a very small zoo enclosure, their training was substandard, they had health problems and serious behavioural problems e.g. pacing and constantly weaving. The zoo had made a commitment to bring in a skilled elephant trainer from another zoo and there were also tentative plans to build a new exhibit. Within a few months of being on the department I realised I had finally found my calling. The keepers were very much focussed on the psychological and physical welfare of the elephants, and were vocal about the fact that the exhibit was terrible, the training/enrichment programs weren’t up to scratch and the physical health of the elephants needed to be improved. Up until this point I wasn’t convinced the zoo was for me, but I was now working with very driven like-minded people who wanted the best for the elephants. We were committed to working hard to achieve the goals we set as a team and to improve the shortcomings we saw in the day-to-day life of the elephants. The defining moment that brought all of these ideas together for me was the first time I undertook the task of washing the 5 tonne bull elephant Bong Su, which would become a daily ritual. Under the guidance of the new training supervisor I’d hose him down, scrub him and complete a range of training behaviours to facilitate reaching all of his body parts during the session. Over time, we introduced more complex behaviours to train to facilitate the wash routine, medical procedures and to mentally challenge him. Another notable training behaviour I taught him was to paint, which he loved to do. When I would bring the painting gear towards him, he would show visible signs of excitement, flapping his ears and eyes bulging. The zoo went on to eventually sell Bong Su’s paintings, with the proceeds going towards conservation. Bong Su was also quite the musician – we trained him to play the harmonica, which he absolutely loved to do. We became mates, both loving the training process and the enrichment that these activities provided to him. The more time I spent with him the more I realised what an impressive animal he was. He had been through a great deal, born in Malaysia, taken from his family at a young age, put on a boat at 6 years of age and sent to a new country where they had very little knowledge about looking after elephants. He lived in a very small exhibit with very limited company for an elephant. He paced (walked circles in his stall) sometimes for up to 16 hours a day, but still remained calm for most of the time and had an extremely good nature. Over time, the benefits of our training and enrichment efforts were obvious by a reduction in his pacing behaviour and his trust in the keepers that worked with him to complete the necessary tasks to facilitate the zoo’s elephant breeding program. You could really see his personality shine in our wash sessions and in the activities we were able to train him to complete. He was eager to work, loved to be scrubbed and learned new skills very quickly. This training ritual created a deep sense of mutual respect and understanding between us, creating a bond that was both deeply satisfying to me on a personal level and also extremely useful in a zoo environment, allowing us to attend to his medical and other needs without extreme measures. We used to sing My Island Home to him during the wash, which was our subtle and constant reminder that we needed to provide him with a whole lot more than he had had to date. We ultimately gave Bong Su everything we set out to achieve. He ended up in a new and much larger exhibit, he had a large herd of elephants around him and several of his own offspring. Achieving these aims was a great feat of training – managing the herd dynamic, the breeding program and continually challenging him physically and mentally. There were many that contributed to achieving these goals, but none more than a select few who dug their heels in and persisted when much of it looked to fail. We did it because Bong Su deserved it and we would accept nothing less. When you look into their eyes daily and truly understand them, you can’t let them down, that’s the contract. Bong Su passed away October 2017. He died too young, but he did have some great years before his passing. 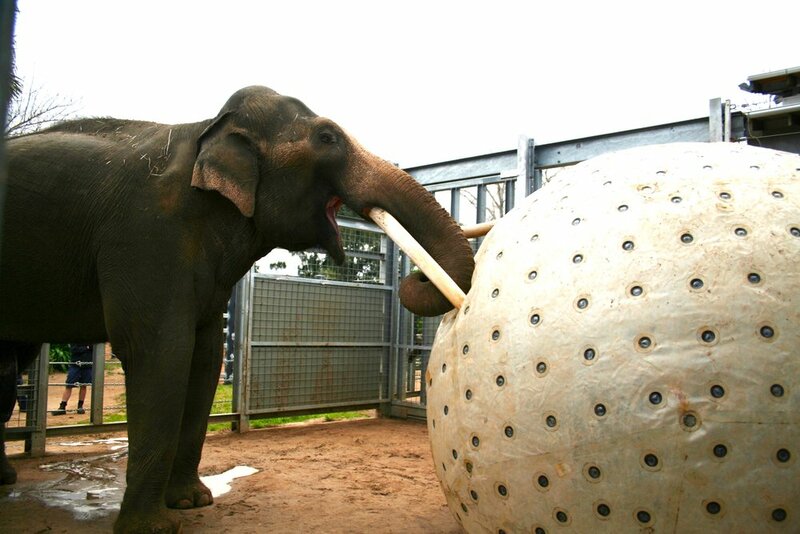 He was regarded among elephant professionals as an extremely unique bull, the gentle giant that was an extremely valuable part of the Australasian captive breeding program. I regard him as one of my closest mates who taught me the real benefits of animal training; how it can drastically improve welfare outcomes for an animal and help us create a meaningful, unbreakable bond. programs, private lessons, workshops and daycare.